@1728-1805. He was born to an influential Westmoreland family. Braithwaite first served in 1743 when he went out to Jamaica under the patronage of his kinsman, Vice-Admiral Sir Chaloner Ogle, the commander-in-chief. He was commissioned lieutenant on 7 May 1755, having been recommended for promotion by Vice-Admiral Sir Edward Hawke, and was advanced to the rank of commander on 29 November 1756 with his appointment to the Polacca 12, which he would command for the next four years. In January 1760 he removed from this vessel in the Mediterranean to the Saltash 10, and upon being posted captain on 6 April 1761 he transferred to the frigate Shannon 28, in which he returned from Gibraltar with a number of pirates as prisoners. Thereafter he continued to command this frigate in the Channel until February 1763. After a period of unemployment Braithwaite joined the Gibraltar 24 in February 1766, sailing for the Newfoundland station in June, and after returning home he commissioned the Liverpool 28 in March 1767 and went out to the same station in May. He later commanded the Liverpool in the Mediterranean from April 1768 before paying her off in 1772. In July 1775 he commissioned the new Centurion 50 in the Thames, going out to North America from Portsmouth in October, and providing valuable protection to the Newfoundland fisheries. On 8 December 1776 he served at the occupation of Rhode Island, and after a short period at Halifax he joined Vice-Admiral Lord Howe’s fleet at New York where he patrolled off Staten Island in July 1777. He later saw service under Howe in the manoeuvres with the French fleet off Rhode Island in August 1778. On 4 November 1778 he left New York for Barbados with Commodore William Hotham’s squadron in order to reinforce the Leeward Islands, seeing action at the Battle of St. Lucia on 15 December. During the Battle of Martinique on 17 April 1780 the Centurion was delegated to support the rear squadron as necessary, and she remained with the fleet for the duration of the Leeward Islands campaign from May-July. 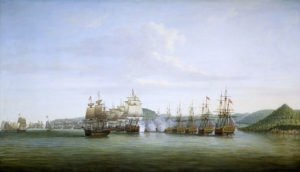 She eventually returned to England with a convoy in the middle of 1780, and after being docked for repairs was paid off in September. Removing to the Bienfaisant 64 in January 1781 in place of her distinguished commander, Captain John MacBride, Braithwaite commanded her at the relief of Gibraltar on 12 April 1781, and at the Battle of the Doggersbank on 5 August 1781 where she suffered casualties of six men killed and twenty-one wounded. He left the vessel at the end of the year, and although it was advised that he would have the first line of battle ship available he did not enjoy any further employment.